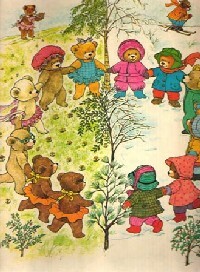 I have painstakingly tried to find some biographical information about Evelyn Scott, the author of The Fourteen Bears. I wondered if she might be the same Evelyn Scott who was born in Tennessee in 1893 and wrote many acclaimed psychological novels of the 1920s and 1930s. Several websites and library databases have indicated that she is the same. But the scholars and descendents have firmly corrected me: she is not the same. 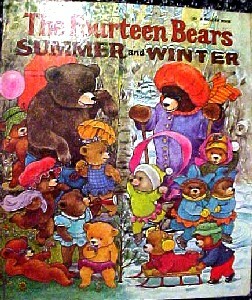 So the mystery remains: who was this Evelyn Scott who won so many hearts with a family of bears? If you know, send me a line. 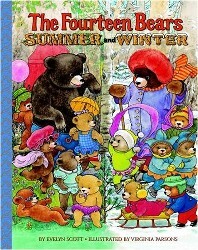 The Fourteen Bears, Summer and Winter. Illustrated by Virginia Parsons. A Golden Book. Racine: Golden Press, 1969, 1973. Reprinted by Random House, 2005. 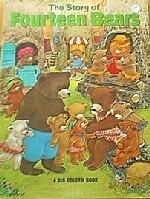 The Story of Fourteen Bears. Illustrated by Virginia Parsons. Golden Press, 1969.